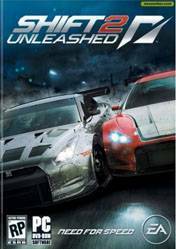 Shift 2: Unleashed (also known as Need for Speed: Shift 2 Unleashed) is a racing video game, the 17th title in the Need for Speed franchise. hift 2: Unleashed career mode is called "entertaining and interactive". Shift 2 claims to redefine the racing simulator genre by delivering authentic and true-to-life dynamic crash physics, intricately detailed real-world cars, drivers and tracks. During their careers, virtual racers partake in a variety of motorsports — like drifting, muscle car racing, retro car racing, Endurance races and circuit competition (i.e. FIA GT3 European Championship) — to hone their driving skills in hopes of becoming the FIA GT1 world champion. nice graphics and awesome cars !